What I loved was the retro feel of it, no special effects, classic animation, no inappropriate humor, just a good clean family movie that you can feel confident taking the little ones to see. Disney returns to the Hundred Acre Wood with “Winnie the Pooh.” Featuring the timeless charm, wit and whimsy of the original featurettes, thisall-new movie reunites audiences with the philosophical “bear of very littlebrain” and friends Tigger, Rabbit, Piglet, Owl, Kanga, Roo – and last, butcertainly not least, Eeyore, who has lost his tail. “Ever have one of thosedays where you just can’t win, Eeyore?” asks Pooh. Owl sends the whole gang ona wild quest to save Christopher Robin from an imaginary culprit. It turns outto be a very busy day for a bear who simply set out to find some honey.Disney’s all-new “Winnie the Pooh” movie is inspired by three stories from A.A.Milne’s books in Disney’s classic, hand-drawn art. Ƹ̵̡Ӝ̵̨̄Ʒ · Exclusive bonus short “Mini-Adventures of Winnie thePooh: The Balloon” – In this charming short, Pooh comes up with a daring plan to get a hold of some honey by fooling a group of bees. Ƹ̵̡Ӝ̵̨̄Ʒ · “The Ballad of Nessie” - The animated short film included in the theatrical release is the heart warming tale of how Nessie found her new home in the Loch Ness. Ƹ̵̡Ӝ̵̨̄Ʒ · “Winnie the Pooh and His Story Too” – A fun and informative behind-the-scenes look at the film, designed for the whole family. 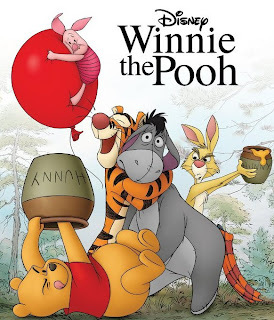 Hosted by John Cleese (narrator of the film), and with occasional help from Pooh himself, this featurette explores Winnie the Pooh’s history from his beginnings as a character in a book, to his continued life in the movies. The filmmakers reveal how they worked to keep the look of the characters and settings in this movie consistent with their first appearances on-screen in1966. Pooh, being a bear of very little mind, finds much of this confusing, but the Narrator and the filmmakers make it all clear to Pooh – and you! Ƹ̵̡Ӝ̵̨̄Ʒ · Sing-Along with the Movie – Follow the red balloon and changing word colors to seven song lyrics featured in the film. 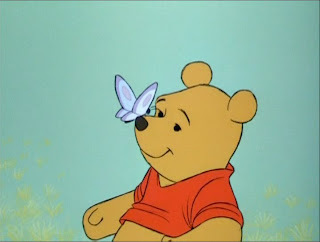 And that 'silly old bear' is even cuter with a butterfly on his nose! Disney movies never disappoint on the butterfly sightings! I'd love to think they are being thrown in there just for me. Want to keep up with your favorite bear in all places social? If you didn't catch this one in the theater you should definitely get the Blu Ray/DVD Combo to add to your home Disney library. 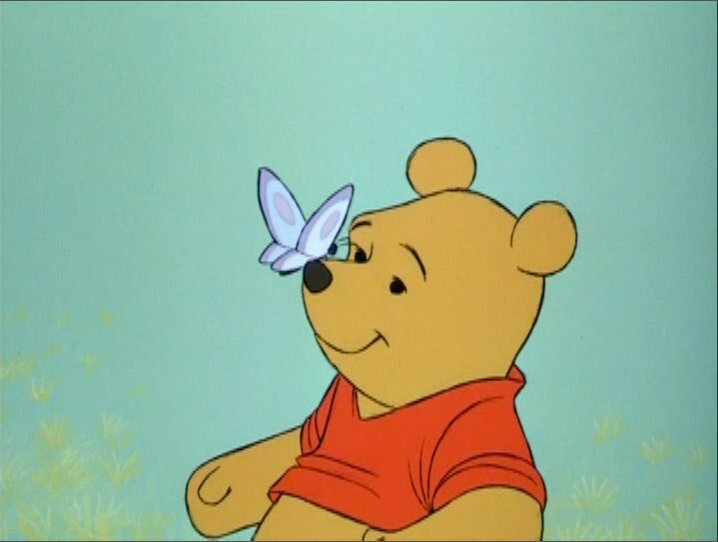 Happy Pooh Bear Tuesday Butterflies! 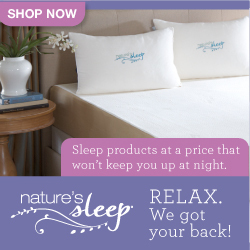 FTC Disclosure: This is NOT a sponsored post. I have received no compensation to review the movie, however screening passes were provided when I saw it in theaters and the Blu-Ray was provided to me for editorial consideration. This is no way influenced my opinion.